The Social Services Department at La Mesa Healthcare Center organizes discharges and arranges services related to discharge. Social Services works closely with all the departments to maintain a comfortable and safe environment for residents staying at our facility. When planning a discharge, the Social Worker considers a variety of factors, some of which may include the impact of physical issues or illness on residents. Communication and facilitation of clinical and psychosocial information is a vital task of the Social Services office, especially in terms of arranging care conferences. Residents are assisted with adaptation to illness and individualized care plans. Our Social Services Department helps the Interdisciplinary Team identify variables that may impede or promote an effective care process. 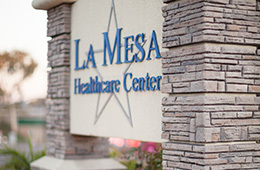 We facilitate interventions in order to help residents reach the maximum benefit from their stay at La Mesa Healthcare Center.